Remember the famous "Herding Cats" Super Bowl video? That's what this year has been like for Bill Charneski! I'm happy to tell you that he's managed to "herd cats", and that we now have a "slate of acquisitions" lined up. To tell the story, I need to go back to last December. We were talking to New York investment banks to finance more acquisitions. Turns out the solution is to THINK BIG. Yes, it is much easier to raise $10 million than $2 or 5 million. But to get there, we needed a whole basket, or slate, of companies. So, Bill Charneski got busy. The challenge was huge, because he had to get one company to agree to be acquired, then get another and another and another... while not losing the rest! It took months, but by the time we retained TCA Capital, Bill had that basket of companies lined up. We believe that the combination of these eligible companies, plus the partnership with TCA Capital, has the potential to get us the acquisitions we are looking for. Now, there is a lot of work ahead still, so please don't bank on this! But... we have never been closer. Tune in on my CEO Briefing TODAY at 5PM PST, for a more detailed discussion of the acquisition picture. "vulnerable to contaminated water, with no fix in sight"
Did you read the story about the town of Enterprise, Louisiana? The water in that town is making people sick. 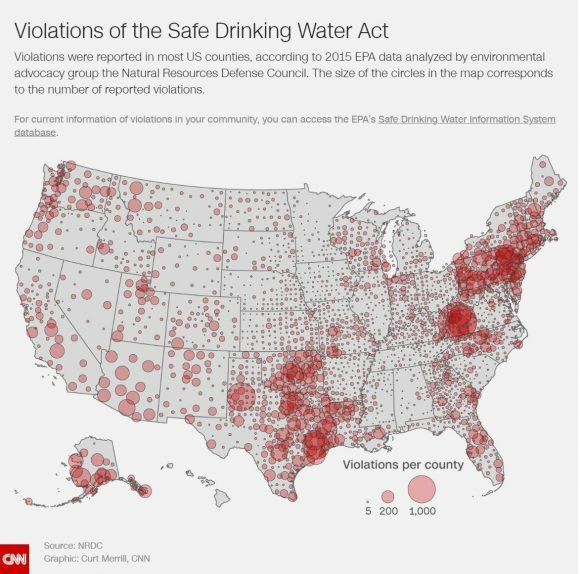 As this CNN article says, "towns like Enterprise are stuck with aging infrastructure that they can't fix, leaving few options for them to deal with complaints about dirty or contaminated water." What's the solution? Self-contained water treatment for the home. I will discuss America's health situation, and our proposed solution, TODAY at 5PM Pacific Time.